Congratulations, you finished the pet chain! Now to raise it. Your first step is to collect Experience Potions of Baby Pet to increase your pet's Experience. Potions are the ONLY way to level your pet until it hits level 11 (then your pet gains experience only by fighting). All the while that you are collecting pet experience potions, you will have to feed your pet with Pet Food to keep it from falling asleep. 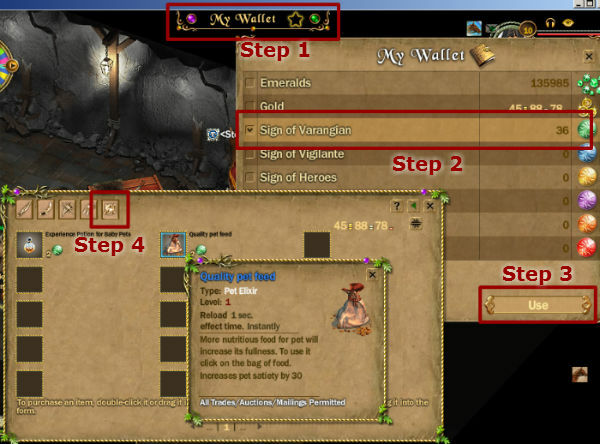 Play subscription minigames and trade any colored wallet signs for pet food/pet exp. To play, click the checkbox icon on the bottom right, then click "Nuts" under the PvP Games tab, and click join. Note: Once joined, the checkmark icon should be surrounded by 4 swirling lights. After you've received signs, click My Wallet on the top of the screen, click "Sign of Varangian", and then click "Use". This will open the sign shop menu so you can see prices and available items. Finally, click the last button on the next popup screen (titled "Gems") to view pet potions. See image below. * Dragon pets require 5000 experience a level, no joke. They are the rarest Pet from the Magic Cocoon and will produce a Server Wide message when someone gets one. It takes around 2200 potions. This is no small feat, but don't be discouraged, Dragons are always a nice addition to your side in a fight. Last edited by EkNa; 10-10-2014 at 01:01 PM.. Both pet food and pet experience potions can be crafted. In addition to having the required professions, you will also need the tools to collect the resources necessary for food crafting. So that's a total of three professions you will need to purchase. You will need to craft Usual Pet's Meal, Good Pet's Meal, or Great pet's meal for pets food (in order of increasing quality). For pet experience, you can craft Set of Baby Pet Experience Potion, or Good potion of baby pet's experience. Last edited by EkNa; 10-11-2014 at 12:01 AM..
You can also purchase the items mentioned above from other players by visiting the auctionhouses in Fragotown, Fragoville, or Northern Mountains and purchasing if other players are selling those items. Each green quality pet experience potion has a cool-down timer of 1 minute, so it will take you at least 200 minutes to get your pet from level 1-11. This seems like a long time, but a trusty and well leveled pet can provide the extra bit of damage to help kill that monster, boss, or player. Last edited by EkNa; 10-10-2014 at 12:57 PM..
Once your pet reaches level 11, two things will happen. 2) Your pet will mature to its second stage. Aggression: Pet attacks all nearby monsters. Protection: Pet only attacks monster that attack either you or your pet. Passive: Your pet will not attack at all. Target: Your pet will attack the selected monster. Return: Your pet will run to where you are. You can no longer use Pet Experience Potions to increase experience. Now, you must fight (monsters) to raise it's levels. Last edited by EkNa; 10-10-2014 at 12:55 PM..
a. Click the icon of an eye, next to your pet, on the top right of your screen. b. Open your Character Characteristics page (bottom icon of a person), mouse over your pet and press the ctrl button. a. Mouse over the pet and press the ctrl button. While your pet is between levels 1 and 11 (when it is still a baby), there is a random chance that a pet armor/weapon slot will open. As the title suggests, you must use a Warrior's Potion to open pet armor/weapon slots. You can find this item in the "SHOP" by clicking "For pets" in the SHOP interface, and finding the Warrior's Potion (5000 emeralds). The Warrior's Potion can also be crafted. The recipe is found with the Tanner and Beastmaster NPC in Fragotown (inside Craftsmen Union building). Click the NPC and on the top tab, select the icon of scroll ("Golden Recipes"). Then simply find Warrior's Potion. You can also open pet armor and weapon slots during the pet upgrade process (where you sacrifice one pet to strengthen another). The sacrificed pet, must have a slot open already. Magical Potion is a potion to open pet ability/spell slots. You can find this item in the "SHOP" by clicking "For pets" in the SHOP interface, and finding he Magical Potion (5000 emeralds). The Magical Potion can also be crafted. The recipe is found with the Tanner and Beastmaster NPC in Fragotown (inside Craftsmen Union building). Click the NPC and on the top tab, select the icon of scroll ("Golden Recipes"). Then simply find Magical Potion. Pet Skill books: are crafted and used on pets so, they have skill capabilities. It can only be used if a pet has open ability slots. You can also open pet ability slots during the pet upgrade process (where you sacrifice one pet to strengthen another). The sacrificed pet, must have a slot open already.